Shooting makes your life crazy. You've got to still your nerves and deaden your heartbeat. You've got to check the flow of the blood in the veins. “Jitu, aapne gold medal jeet kar meri saari limelight cheen li — you’ve taken away the limelight from me!” said Shweta Chaudhary as she congratulated the 50m air pistol shooter for winning India’s first gold. It’s a story of incompetence so amazing that it would be funny — but for the fact that it spells tragedy for India’s prospects. Olympics silver medallist Vijay Kumar, Delhi Commonwealth Games gold medallist Gurpreet Singh, centre fire pistol shooter Pemba Tamang and multiple-event winner Samresh Jung are going to go into their events without their official practice sessions. Gopi, Vimal in Saina’s corner, but who’s the coach? It was quite a peculiar sight — Pullela Gopi Chand stood by quietly as Vimal Kumar instructed and advised Saina Nehwal during the breaks in the women’s badminton team match against Thailand here today. Gopi Chand had been Saina’s coach during her rise to superstardom. Indian weightlifters began their campaign on a disappointing note as all three contestants finished at the bottom half of the table in their respective categories. In women's 48 kg category, Khumukcham Sanjita Chanu and Saikhom Mirabai Chanu, the gold and silver medallists at Glasgow, finished 10th and ninth respectively out of 13 lifters. 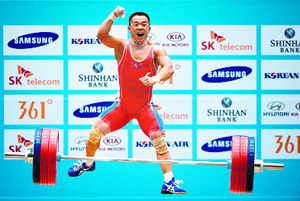 Sukhen Dey, another Commonwealth Games gold medallist, finished 12th among 14 lifters in the men's 56 kg category. Sukhen ended fifth in his group of six lifters with a total of 242 kg (106+136). What would you call a knock of 23 off just nine balls — a cameo? And, if it comes off the bat of a rookie all-rounder — sheer luck? What if the guy, from Gujarat, does it with a left hand — Dhokla King? Maintaining her rich vein of form in the current season, Indian tennis ace Sania Mirza and her Zimbabwean partner Cara Black today bagged the women’s doubles title at the WTA Toray Pacific Open with a 6-2 7-5 victory over Spain’s Garbine Muguruza and Carla Suarez Navarro. Perth Scorchers’ Mitchell Marsh hit sixes off the last two balls to pull off a thrilling win against the Dolphins in their CLT20 match at the PCA stadium here today. Needing 16 off 6 balls, Ashton Turner wasted the first three balls before getting a single and finally getting the set batsman, Marsh, on strike. Though the match seemed to have slipped out of their hands, Marsh (40 off 26) did the unthinkable and ruined what could have turned out to be a match-winning over by Robbie Frylinck. 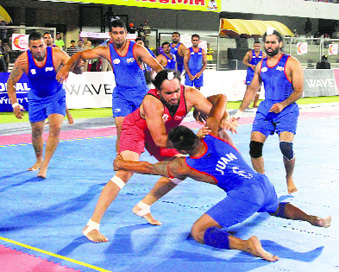 Khalsa Warriors, so far the most dominant team of the World Kabaddi League, put even more distance between itself and the rest with a 57-50 win over United Singhs in the first match on Saturday. The only unbeaten side of the WKL won their seventh match in eight games, with one tie also against their name. Mesut Ozil helped Arsenal shake off the hangover of a midweek pounding in Germany with a starring role in a 3-0 victory at Aston Villa in the Premier League on Saturday. Arsenal’s record signing came in for particular criticism after the 2-0 defeat by Borussia Dortmund in the Champions League on Wednesday, but he came alive before halftime. His first away goal in an Arsenal shirt put his side ahead after 32 minutes, he then teed up Danny Welbeck for his first Arsenal goal two minutes later before an own goal by Villa’s Aly Cissokho ended the game as a contest after 36. Shooting makes your life crazy. You've got to still your nerves and deaden your heartbeat. You've got to check the flow of the blood in the veins. The very breath that sustains the shooter is his enemy — they breathe with caution so that no tremors are transmitted to the gun. Your life could be devoted to staring a pea-sized target, the bulls-eye, 50m away, in lonely halls in practice or in packed competition venues. The highest goal of your life is to hit the very centre of the pea every time you press the trigger. Now, Jitu Rai is the very picture of politeness. He's short, slight of build. When he bows and shakes your hand with his right, his left hand’s palm cups the right elbow, in a sign of respect. He smiles gently, and he blushes when we advise him to kiss his medal for a photograph. But under that exterior is flint — the strongest kind of flint. Shooting makes your life crazy — you've got to be super-strong in the mind to excel in it. “Sir, dimag thanda honey do, phir baat karunga,” said Rai, India’s first gold medallist of the Asian Games, as he walked off the shooting range today. Rai's gun did most of the talking today in the 50m air pistol event. He’d qualified with the seventh-best score for the final today. After 18 of the 20 shots of the final, he was placed second — just .7 of a point behind Hoang Phuong Nguyen of Vietnam. This is the moment when palms sweat, the shoulder creaks, the pistol begins to weigh like a canon. This is the moment shooters can crack. This is the moment of truth. Rai, his left hand in his pocket, held his breath, looked at the target, and waited and waited and waited. It seemed like an eternity to the watcher — it was perhaps only 10-15 seconds. To Rai, it surely seemed longer than an eternity. Rai wanted to make it count with the deepest 10 possible — eventually, he fired and shot a 9.6. Nguyen had shot a 8.7. Rai's advantage of.9 point on that shot put him in lead by .2 point. Rai then held his nerve on the final shot, even as Nguyen lost his head — he shot a shocking 5.8. Rai too got a low score, 8.4, but that was enough for gold. 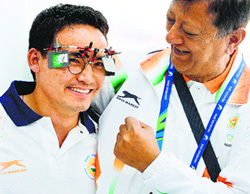 Rai has been inspirational this year — in 10m and 50m air pistol event, he's won three medals in the World Cups (one gold, one silver and one bronze), the gold at the Commonwealth Games in Glasgow, and the silver in the recent World Championship in Grenada, in which he shot 191.1 in the final then. She was only jesting, of course, because everyone loves the gentle Jitu Rai. But Shweta deserved the limelight as much for a particular reason – the pistol she uses in her event, the 10m Air Pistol, had been lying with the Customs Department, and she had been upset and distraught over the last few days. She had to use a new pistol, which she had bought during the World Championship in Grenada recently. “I’d used it for only one hour during practice yesterday, firing some 30 shots with it,” Shweta said later. Each time shooters fly to a tournament, the country’s shooting association sends the serial numbers of their weapons to the organisers, who give the numbers to the Customs Department. For some reasons, the serial number of her old pistol was not with the Customs officials when she arrived — this resulted in the confiscation of the weapon at the airport. Shweta, 28, did little wrong today herself, even as the more fancied Heena Sidhu failed to reach the final. Shweta qualified fourth-best among the eight finalists, with 383 points, one point behind two Koreans and a China shooter, who were joint first with 384 points each. In the final, Shweta led the field after six of the 20 shots, with 60.8 points; but her eighth shot got her a horrible 7.7, plunging her down to sixth. She recovered, however, and eliminated China's Guo Wenjun after the 16th shot to ensure a bronze for herself. Under pressure, Shweta shot a remarkable 10.7 in the shoot-off that eliminated Guo. Shweta said that this was the biggest medal of her life – bigger than the team silver she won in the 2006 Asiad, or the gold won at the Commonwealth Shooting Championship in 2010. Her start in shooting hadn’t been very encouraging – she actually shot herself in her foot the first time she was taken to the shooting range by her father, Ramesh Chaudhary, who’s in the real estate business. She can laugh it off now, but said: “I’ve still got that scar!” She wasn’t too keen to continue and dropped the sport, but her father encouraged her to return to the range. He often travels with Shweta, but he’s not here, because it’s a short event and they didn’t wish to go through the hassle of arranging for accommodation. She missed her family, and she’d not even talked with them well after her medal, but she was confident that they were up at 4 am today, following her performance. This means that are going to go into competition with no practice here, getting into action soon after reaching the city, with no time to acclimatise. The delay in getting the accreditation cards of the shooters, which was reported two days ago, will thus cause greater grief than earlier thought. Three of the four are currently in Spain, from where they will go to New Delhi to apply for their visas for Incheon. The fourth, Jung, was scheduled to reach Incheon tonight — and he’d be straightaway plunged into competition, the 10m air pistol event, scheduled to be held on Sunday morning. As reported earlier, only seven of the 43 Indian shooters had their accreditation cards ready in time. The accreditation cards act as visa-waivers for the athletes and delegates, and the absence of the cards forced the 36 shooters to apply for visas in New Delhi. If the accreditation passes had been prepared, they would have been able to fly to Incheon right from Grenada. The trip to Delhi, and applying for the visas, wasted precious time, which should have been spent in acclimatisation and practice here. Most of the 36 have arrived here, tired and upset, but the above-named four are yet to reach here. The World Shooting Championship ended in Grenada, Spain, today. The events of the above-named four were among the last in the World Championships, so they had to remain in Grenada. The others – 32 of them – came to India, applied for the visas at the Korean embassy, and reached here over the last two days. Vijay Kumar has been going through a slump, worsened by a shoulder injury; the London Olympics rapid-fire silver winner didn’t do well in the Glasgow Commonwealth Games. He hasn’t been able to land a berth in the rapid fire team, and his chances here in the centre fire event may be minimal, but one cannot really rule out a proven shooter. Pemba Tamang, partner of Vijay Kumar in the 25m centre fire event, will rue the missed practice session, too. If the accreditation passes had been prepared on time, this trouble would not have hit the Indian team. The NRAI has said that it’s not their fault, that the Asian Games organisers had been sent the accreditation requests for all shooters in time. Whose fault is it, then? It’s certainly not the fault of the shooters. This was Saina’s first tournament after Vimal took over. Vimal Kumar, though, took over as her coach recently, giving rise to the unusual situation today — national coach Gopi Chand and Vimal Kumar sat together in Saina’s corner today, but when it came to passing advice, Gopi Chand had little to do. Saina beat Ratchanok Intanon 21-15, 17-21, 21-18 in the first match of the team event; a very creditable win, for Ratchanok is ranked No. 5 in the world and was the last year’s world champion. When Saina discussed the presence of the two coaches in her corner today, she left some room for ambiguity about who’s her coach here. It may have been out of habit that she said that “he is my coach” about Gopi Chand; but she also said that “I wanted to work with him (Vimal Kumar) for a few days before this event”. Before this event? So perhaps Gopi Chand is still her coach during this event? Vimal Kumar and Gopi Chand, as they sat together, were the cynosure of all eyes today; Vimal was more animated of the two even while cheering the points Saina won. During the breaks between the games, Vimal did most of the talking while Gopi Chand stood next to him and Saina. Vimal talked and gestured in an animated manner, pointing to various parts of the court; having finished, however, he would look at Gopi Chand, almost as if he wanted his opinion on what was discussed. Gopi Chand would make very brief remarks, lasting perhaps 10 seconds, before the two walked back to their chairs in the corner. 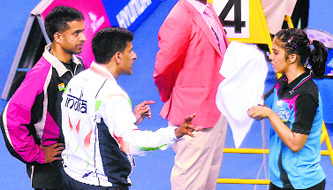 So, how did Saina feel about Gopi Chand standing quietly there, even as Vimal Kumar advised her? “I think it’s better that he (Vimal) tells me something right now, because Gopi Sir didn’t see me play the last two weeks, so I think let him (Gopi) just see how it is going,” she said. And does she go to Gopi for advice? “He’s my coach, obviously!” she said. In the second singles match, PV Sindhu beat Porntip Buranaprasertsuk 21-15, 21-13 to put India 2-0 up. However, Chandrika Thulasi lost to Busanan Ongbamrungphan; and Nelakurthi Reddy and Pradnya Gadre lost the first doubles match to Porntip and Kunchala Voravichitchaikul. The rubber was now tied 2-2, and then PV Sindhu and Ashwini Ponnappa took to the court against Sapsiree Taerattanachai and Saralee Thoungthongkam. The Indian team isn’t a regular combination, and Sindhu was filling in for Jwala Gutta, Ashwini’s regular partner. However, they assured India of at least a bronze with a 21-16, 21-17 win. India would take on South Korea in the semifinals tomorrow. India began their campaign in wushu competition on a mixed note with two players making it to the quarterfinals while four of them making an early exit from the Games here today. Narender Grewal beat Mangal Prasad Tharu of Nepal in 'win by round' verdict in his round of 16 Sanda 60kg contest. The Indian won 2-0. 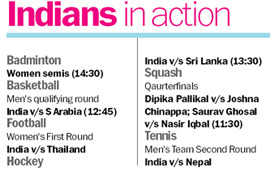 Grewal take on Abdullah of Pakistan in the quarterfinals on Monday. Yumnam Sanathoi Devi also made it to the quarterfinal round in women's 52kg event after defeating Kamalova Mubarak of Uzbekistan. India is assured of its first ever women's singles medal in the Asian Games after top players Dipika Pallikal and Joshana Chinappa won their respective openers here on Saturday and set up an exciting contest in the quarterfinals. World No. 21 Chinappa blanked 183rd ranked South Korea Song Sunmi 11-9 11-7 11-7 at the Yeorumul Squash Courts. Soon after, world No. 12 Pallikal stepped on the court against 150th ranked Jinyue Gu of China. The highest-ranked Indian slipped a bit before prevailing 11-6 10-12 11-6 11-4. Indian male cagers started their campaign on a resounding note, thrashing a lowly Palestine 89-49 in their opening encounter here on Saturday. India dominated Palestine in all the four quarters with Amjyot Singh turning out to be the highest scorer for the formers with 25 points. The Indians raced to a 20-6 lead in the first quarter and then extended it to 40-23 at the second break. Akshar Patel, who till now was known more for his left-arm spin, will no more be a rabbit with the bat. The Twenty-year-old today brought it back for Kings XI Punjab just when it looked like drifting away at their home ground. David Miller may have been adjudged the Man of the Match for his well-paced innings of 46 runs, but it was the wiry Patel who brought smiles to the faces of the Mohali crowd. Often in T20 it’s just an over that makes or mars the whole game. For Kings XI, it was the 18th over of the second innings when the game took the decisive turn and finally fell in their bag. Patel, with the help of some luck and a lot of pluck, managed to score 19 runs. Two consecutive fours, a single, then a four and finally a hook brought Kings XI Punjab back into the game with 25 runs required off 12 balls. Given the sluggish pace of the Kings XI batsmen, it looked very, very difficult but Ravi Rampaul, with his largesse, made it easy for Patel. Kings XI Punjab could not have thanked the medium pacer enough as they registered a 4-wicket win with 2 balls remaining over Barbados Tridents. Tridents had scored 174/6 as Raymon Reifer scored an unbeaten 60 and Dilshan Munaweera scored a power-packed fifty. Both the batsmen breached the long-on and midwicket region repeatedly with their clean hits. Munaweera took the lead and reached 50 when the Tridents total was 61 runs. Reifer delivered the parting shots. Kings XI Punjab too got a fiery start on the shoulders of Virender Sehwag but slacked as the innings progressed. Miller ensured there was crunch of wickets as Patel went bang bang at Mohali. And just when it looked like going to the wire, Miller brought an abrupt end to the match with a mighty heave over wide long-on for a six. 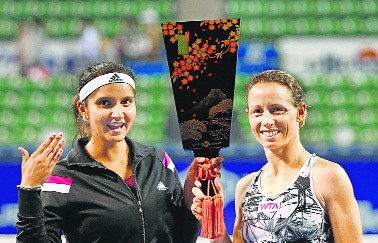 With the win, Sania and Cara have successfully defended their Tokyo Open title. The duo took just an hour and 15 minutes to dispose the Spanish challenge as their opponents were no match. The Indo-Zimbabwean pair had a greater percentage (73%) of points won on first serve while they broke their opponents seven times in the match. Ana Ivanovic overcame a slow start to beat top seed Angelique Kerber 7-5 6-3 in the semifinal to set up a title clash with second seed Caroline Wozniacki. World No. 10 Ivanovic, seeded third in the $1 million event, was down 5-3 in the opening set but went on to win 10 of the next 13 games to seal her victory. Chasing 165 for victory, the Scorchers started on a calm note. After Adam Voges (7 off 11) fell in the third over, lbw by right arm medium pacer Kyle Abbott, Craig Simmons ( 48 off 36) played an essential innings. He fell short of completing his half century when he was caught and bowled by Cameron Delport. Sam Whiteman carried forward the momentum along with Marsh before the former was dismissed by Craig Alexander. Brief scores: Dolphins: 164/7 (Zondo* 63, Maharaj 29; Behrendorff 3/46, Paris 2/21); Perth Scorchers: 165/4 (Simmons 48, Whiteman 45, Marsh* 40). Khalsa Warriors, so far the most dominant team of the World Kabaddi League, put even more distance between itself and the rest with a 57-50 win over United Singhs in the first match on Saturday. The only unbeaten side of the WKL won their seventh match in eight games, with one tie also against their name. The early part of the matches tend to be very tight as it was between Khalsa and United, when they were tied 13-13 after the first quarter and it became 27-26 for the Warriors at the midway stage. The Warriors, who have been very tenacious in the WKL, seemed determined to move ahead in the third quarter as the game became more tensed. Khalsa Warriors’ raiders, Gagandeep and Manjot Singh Gill, took their team into a strong position. In the final session, that edge stayed with the Warriors as they closed the match 57-50. Manjot was adjudged the Man of the Match and the Best Raider. Mumbai: The BCCI has decided to shift Jammu and Kashmir’s Ranji Trophy home matches to Mohali, following the devastating floods that hit the state which has left the two cricket grounds in deplorable condition. “Recently, we have taken a decision that due to the natural calamity in Jammu and Kashmir, Punjab Cricket Association have come forward, and all of Jammu and Kashmir’s home games will be played at Mohali,” BCCI secretary Sanjay Patel said.